SharpReader is an advanced type of reader that will allow you to simply and quickly read the most recent updates from your favorite web sites. This RSS reader is full of features that will help to improve your entire reading experience. Ability to handle all types of RSS versions including ATOM 1.0 and 0.3 and modules such as Dublin core. Provides users with advanced threading support that will allow you to view the connected items all together in a threaded type of fashion. Custom categories created with group subscribed feeds. The feed settings such as purge timeout and refresh rate are able to be set per category or per feed. 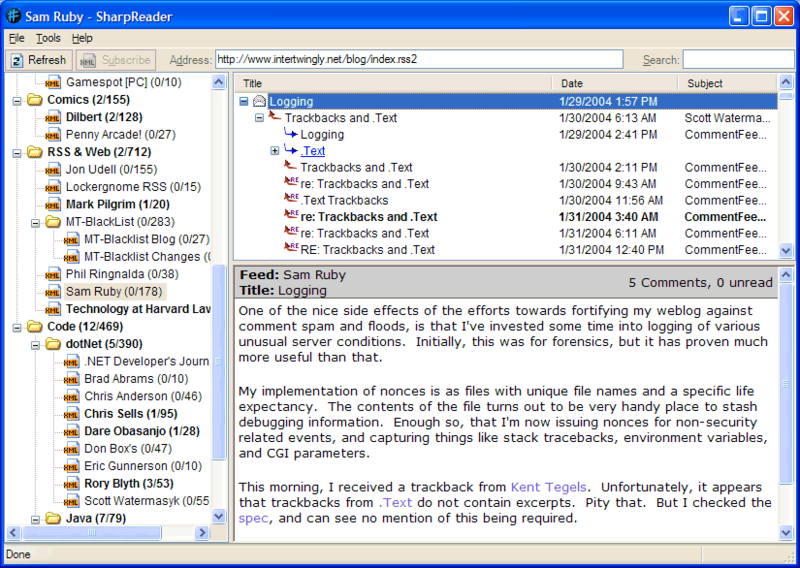 The SharpReader freeware allows the users to easily organize their subscribed feeds into various categories. The categories are able to be modified in a way that will suit the preference of the user with simple drop and drag movements. With SharpReader, they are also able to modify the way that the feeds are viewed, further customizing the experience. Additionally, it will allow users to mark certain items, filter the items by text or age, and select a refresh period and a number of other options. Generally speaking, SharpReader is an extremely functional RSS feeder that will provide users with a wide array of options allowing them to enjoy their chosen news feeds. Using this reader will give you a simple and convenient way to see what is going on with a glance. There will be no shuffling around to different sites – the process is simple and able to be used by anyone those who are tech savvy and those who are not.